Situated in the midst of the Pacific Ocean, Hawaii is a tropical paradise of beautiful beaches, exotic flowers, and year-round warmth. With plenty of educational and cultural attractions, Hawaii is on the bucket list of many people, including kids. 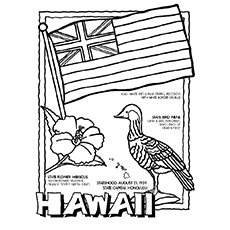 So, if you want to acquaint your child with the culture and customs of Hawaii before visiting the place, then Hawaiian coloring pages will come handy. Here are ten HawaiI coloring pages for you and your kids to enjoy. Introduce your kid to the beautiful state Hawaii with this coloring page. Hawaii is the only American state that is made entirely of islands. It was recognized in 1959, making it the most recent state to join the United States. Hawaii is home to the largest active volcano on Earth. Instruct your kid to color the flag stripes white, red and blue. The cross should be painted red and white. Gray and tan would look best for the Nene bird. 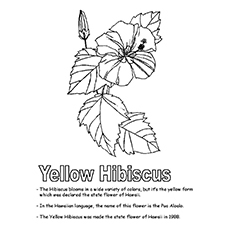 And for the hibiscus flower, use yellow for the petals, center orange and leaves green. This coloring page features Tiki, the Hawaiian god. In the Maori mythology, Tiki is the first being created by Tane. These spiritual figures have big, scary mouths and menacing expressions that frighten evil spirits away. Some Hawaiian Tiki gods also have various headdresses, each carrying a different meaning. 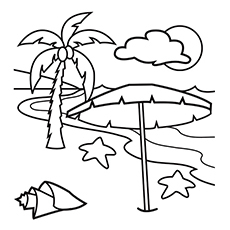 Take your kid on a ride to the Hawaiian beach with this detailed coloring page. Seeing young athletes surfing in the water of Hawaiian sea is a common sight. Wave sliding or surfing has been a popular sport in Hawaii for generations. It gained exposure and popularity in the 1920s, all thanks to the Olympic swimmer Duke Kahanamoku. This fun coloring page is an entertaining way to talk about the family vacation. Ask your kid where he would like to head to this summer and see what he replies. The stunning flower hibiscus blooms in a variety of colors, but the tropical and lush state of Hawaii selected the yellow hibiscus as its state flower in the year 1988. The name of this flower in the Hawaiian language is Pua Aloala. Hibiscus arnottianus is the native hibiscus found in the island. The flower is also popular as an ornamental flower. Which color would your kid select for this hawaiian flower coloring pages? 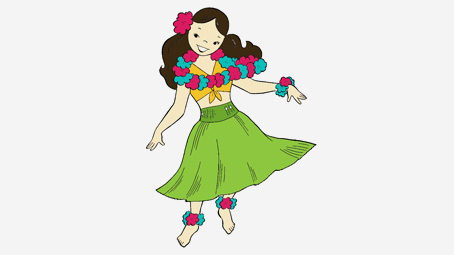 Take your little one on a virtual vacation to Hawaii with this fun coloring page featuring a hula dancer dancing to the tunes of ukulele played by a young girl. The hula is a ritual dance that narrates stories through music. James Cook, the British explorer, found hundreds of different hula dancers when he set his foot on the island in 1778. Make sure your kid uses bright and bold colors for the lei garland the dancer is wearing. 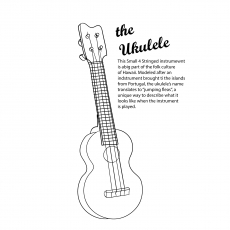 Here’s Hawaii coloring page of the ukulele, a small, four-stringed musical instrument. Modeled after the instrument brought to Hawaii from Portugal, the ukulele has been a part of Hawaiian folk culture for centuries. The Hawaiians developed it in the 19th century by altering the size and wood of the original instrument slightly. The name ukulele translates to ‘jumping fleas’, an unusual way to describe a musical instrument, for sure! Why don’t you teach your kid the basics of the ukulele after coloring this page? It will make for a fun activity for both of you! Hawaii is home to some of the rare animals, birds and fish that can be found only on the island. One such animal is Nene or Hawaiian Goose, the Hawaiian State Bird. 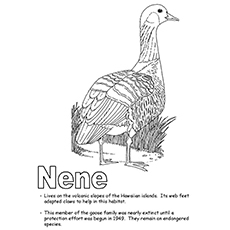 Nene evolved from the Canadian goose, which migrated to the Hawaiian island around half a million years ago. It is endemic only to Hawaii, so you will not find it anywhere else in the world. Sadly, Nene is struggling against extinction. It has already made its way on the endangered list. But conservationists are trying hard, and the rescue efforts are underway. They are breeding the birds in captivity with the hopes of preserving the remainder of the declining population. 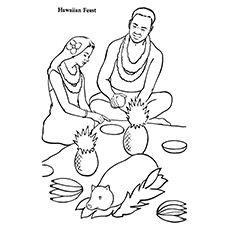 Acquaint your kid with Luau with this yummy coloring page featuring a young couple enjoying a Hawaiian feast. The luau is a traditional Hawaiian feast accompanied by entertainment. It features beer, fruits, poi, lomilomi salmon and kalua pig, the main dish. Utensils are never given to the guests as they need to eat everything by hand. Tell your kid to color the banana, pork and pineapples as he learns about the Hawaiian cuisine. 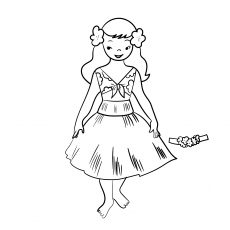 Here’s a Hawaiian coloring sheets of little girl Moana wearing a wreath of flowers called Lei. 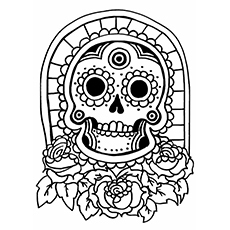 This coloring page will make a perfect summer activity for children. The Lei is a wreath of flowers presented to the guests upon arrival in Hawaii as a symbol of affection. A traditional lei is made using flowers, leaves, shells, flowers and teeth of various animals. The ancient Hawaiians used this wreath to beautify and distinguish themselves from others. It even signified a peace agreement between two opposing chiefs. Did you know that there are several methods of making lei? The cute, little girl you see here is Lilo Pelekai, the current face of Hawaii. She is the deuteragonist of Disney’s animated film “Lilo & Stitch”. Lilo is a young, orphan girl living on the island of Kauai in Hawaii with her elder sister Nani. This 6-year-old Hawaiian girl has straight black hair and beautiful brown eyes. You will see her wearing a muumuu and sandals throughout the film. 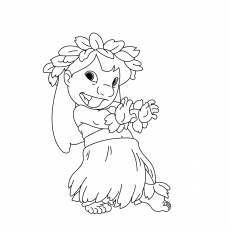 But in this coloring page, Lilo is dressed in traditional Hawaiian costume, complete with grass skirt and lei wreath. Isn’t she looking adorable? She’ll look even more adorable if your kid adds some color to it. So what you are waiting for? Print out all our Hawaiian coloring pages to keep the kids entertained during the holidays. These Hawaiian coloring pages are a fun way to develop focus, creativity and motor skills in children. 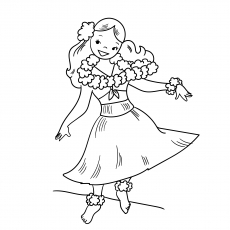 These coloring pages of Hawaii will also make a great addition to your Luau party. Which of these Hawaiian themed coloring pages did your little one enjoyed coloring the most? Share with us by commenting below!